The John C. Hitt Library provides public and classroom PCs for use by patrons. Students find books, articles, databases, and digital collections; access web courses and review their class schedules; prepare papers, presentations, and other materials; and receive information literacy and library instruction as part of their coursework. Laptops and iPads are available for checkout at the Media Desk. The current PCs were purchased in 2007 and 2009 with 4-year warranties. The 2007 purchases are now out of warranty and the 2009 model warranties will expire in 2013. They are all Dell OptiPlex FX160s, with single core Pentium M 2.0GHz processors, 2GB memory, and 80GB HDs. The laptops are Dell Latitude D530s (Intel Core 2 Duo 2.2 GHz processor with 1GB memory), purchased in 2008, and Dell Latitude 2100s (Intel Atom GZ95461 processor with 1GB memory), purchased in 2009. The 2008 purchases are out of warranty and the 2009 purchases will be out of warranty in November 2012. Once they are out of warranty, as they fail these PCs and laptops cannot be repaired without incurring significant cost. Replace 280 public PCs with all-in-one units and include 10 additional units for backup. The PC model is a Dell OptiPlex 9010 AIO, Intel Core i5 processor, 8GB memory, 250GB HD, 8X Slimline DVD+/-RW drive, 23” display. Replace the 6 PCs with large monitors in the Knowledge Commons used for collaboration. The PC is a Dell OptiPlex 9010 Ultra Small Form Factor, Intel Core i7 processor, 8GB memory, 320GB HD. Replace 44 PCs in Rooms 235A and 235C with all-in-one units. The PC model is also a Dell OptiPlex 9010 AIO, Intel Core i5 processor, 8GB memory, 250GB HD, 8X Slimline DVD+/-RW drive, 23” display. Replace 15 out-of-warranty laptops of the 63 currently checked out at the Media Desk. The laptop is a Dell Latitude E6430, Intel Core i5 processor, 6GB memory, 500GB HD, 8X DVD+/-RW drive, 14” display. Computrace software will be loaded for security purposes. Add 55 iPads to the 45 currently checked out at the Media Desk. The iPad is the 16GB model. For many years the Libraries received funding for technology purchases from the Florida Center for Library Automation (FCLA), the organization that also supports the library management system (catalog, circulation, etc.) for the state universities in Florida. FCLA ceased to exist in June 2012 and a new organization, the Florida Virtual Campus, now includes both state university and college libraries under its umbrella. Funding for technology purchases is no longer available. 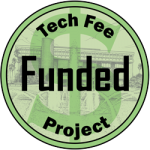 There are no other funds to support technology purchases so technology fee awards have become the Libraries’ single source for student-facing technology funding. This proposal is being submitted to request funding to replace current public and classroom PCs, some laptops, and increase the number of iPads available in the John C. Hitt Library. 2. The John C. Hitt Library is open approximately 105 hours per week. All public PCs are available when the library is open. Classroom PCs are available during scheduled class times for most of the semester. The classrooms are opened the last three weeks of classes so more PCs are available at this busy time. Laptops and iPads are available for checkout from opening until a half hour before closing. 3. There are 286 public PCs, 6 of which are collaborative stations that will accommodate 4-5 at a station. On a one-to-one scale, 286 students can use the PCs. With 5 at each of the 6 collaborative stations the total simultaneous users increases to 310. That number would increase by 163 when adding laptops and iPads, and an additional 44 when the classroom PCs are made available at the end of the semester. In many cases students collaborate on their work and share a PC, especially in the Knowledge Commons area, but those numbers have not been measured. The John C. Hitt Library is open more hours than any other building on campus. Students depend on the availability of our equipment to do their work. The public PCs, laptops and iPads are extremely popular. The Libraries developed a computer availability page to alert students to free PCs on each floor of the building, and signs are posted at the Media Desk on the 3rd floor when all laptops and iPads are checked out. The classrooms are open the last 3 weeks of the semester so students have access to additional PCs to finish their end of semester assignments. As classrooms, an average of 313 library instruction classes have been held 235A & C over the last 4 years serving 8,407 students per year. PC success will be measured first by a random survey of PC use taken from our computer availability tracker to determine turnover and then by an online survey made available on the public PC desktop. It is already known that the public computers are fully used most of the day, most heavily between 10 a.m. and 2 p.m. Additional studies will reveal the length of time on the PCs, student opinion of computer performance, software availability, and suggestions for improvements. The Libraries projects the lifespan of PCs to be 5 years and purchases extended warranties to support this plan. In order to stagger the expense of replacement in the future, the PCs will be purchased in 2 stages, half at the beginning of the funding year and half at the end. The library renovation project may begin in 3-5 years and these PCs are expected to be in service until then. The laptops and iPads currently in use will be cycled out as they age and move out of warranty. Laptop and iPad lifespans are 4 years and purchasing has been staggered. Technology fee proposals will be submitted to replace older models in the future. The IT department in the John C. Hitt Library will install and maintain the equipment. The budget includes replacement PCs and laptops and new iPads. There is already infrastructure to support the equipment so no Facilities Improvement is needed and existing furniture will be used. Some accessories including cases and skins (screen protection) for the iPads, PC locks, and Computrace software for the laptops have also been included. Price quotes for the listed equipment have been received from the UCF Technology Product Center so the budget has been built from those numbers.